Adventure Map New Zealand  - $9.95 : Trail Explorers Outpost, Keeping the Adventure Alive! National Geographic's New Zealand AdventureMap is designed to meet the unique needs of adventure travelers detailed, durable, and accurate. New Zealand includes the locations of thousands of major cities and towns with an index for easily locating them, plus a clearly marked road network complete with distances and designations for major highways, toll roads, limited access highways and more. What sets National Geographic AdventureMaps apart from traditional road maps are the hundreds of points-of-interest that highlight the diverse, unique, and exotic destinations within New Zealand including National Parks and Preserves, World Heritage Sites, Archeological sites, ski areas, beaches, golf courses, camping areas, waterfalls, natural points of interest and important travel aids like airports, airstrips, rail lines, lighthouses, and harbors. 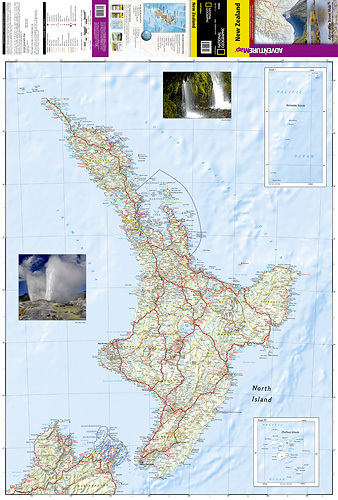 The north side of the map details New Zealand's north island including Auckland, Wellington, Hauraki Gulf Maritime Park, Egmont National Park, Te Urewera National Park, and Poor Knights Islands. The south side overlaps with northern side and covers the south island. Some of the places detailed on the south side include Marlborough Sounds Maritime Park, Christ Church, Fiordland National Park, and Stewart Island. 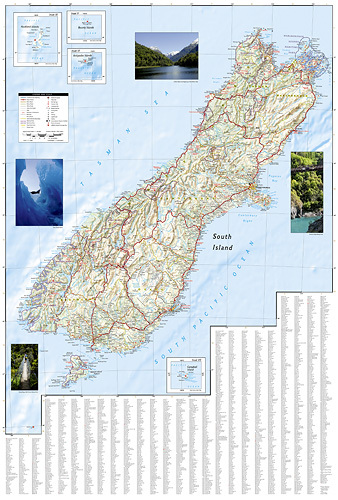 Six inset maps provide locations for islands off the coast of New Zealand, providing coverage for the entire country.